Some members of the Saskatoon Co-op are now targeting its nine board members with an online petition calling for their removal. After nearly a week on the picket lines, striking Saskatoon Co-op workers say they will not accept a two-tiered wage proposal. Both sides emerged from bargaining last week at a stalemate, with no further negotiations scheduled until November 29. Saskatoon Co-op has said its offer does not lower current employees' wages and allows for what it calls "industry-leading" wage increases of two per cent each year. Grant Wicks, Saskatoon Co-op's CEO, said with staffing costs now accounting for 60 per cent of expenses, the retail co-operative needs to control costs. Union members have rejected a proposed two-tiered wage proposal, where new hires would be paid less than current employees doing the same work. The dispute has some Co-op members in Saskatoon calling for the removal of the nine directors who oversee managers of the grocery, fuel, liquor, farm supply and hardware retail outlets. "The Co-op is a democratic organization," said Craig Thebaud, who speaks for Friends and Saskatoon Co-op Members For The Fair Treatment Of Employees. "The only way to make them listen is to remove them," said Craig Thebaud, who said his group has gathered 250 of the 300 signatures required to trigger a special meeting of Saskatoon Co-op members. "It's disheartening when you see that people aren't being treated fairly." he said. He said his group has collected 250 of the 300 signatures required to trigger a special members' meeting. Saskatoon Co-op has more than 116,000 members. "We've passed motions I've seen at other Co-op AGMs that never come to fruition," said Thebaud. "The only way to make [the directors] listen is to remove them,"
Thebaud said he worked at the Co-op a decade ago, and has worked "sporadically" for UFCW, but left the organization two years ago. Saskatoon Co-op CEO Grant Wicks said the petition is "a very thinly veiled attempt on the part of Local 1400 to hijack the negotiations." "It's a glaring example of bargaining in bad faith," Wicks said. "The union has chosen to try and circumvent the collective bargaining process and they have attacked my board of directors. "The spokesperson in question is very clearly linked to the UFCW Local 1400. He was our union rep here for many years. He's suggesting he is just a concerned Co-op member, but clearly this is orchestrated 100 per cent by the UFCW." Workers wearing toques and parkas on the picket line told CBC they do not foresee a swift end to the dispute. 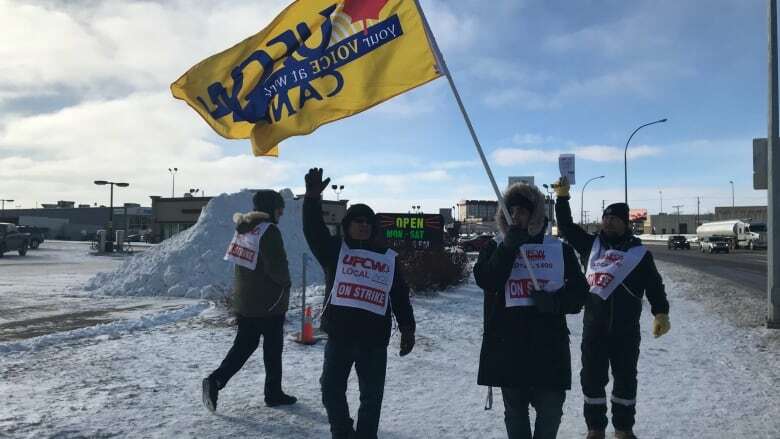 United Food Commercial and Workers Local 1400 said it has provided Saskatoon Co-op's bargaining team with alternate proposals. "It's been met with silence or a very clear 'we're not interested'," said Rod Gillies, UFCW's lead negotiator. Gillies said the union does not see a need to turf any of the Saskatoon Co-op's board members. "It's the CEO and the employer's committee that have to answer to the board of directors," Gillies said. "Their unwillingness to bargain and their silence on the subject of union proposals, we find that disappointing and a little disturbing," he said. UFCW said Co-op's offer would lower wages across 77 per cent of job classifications, including mentally challenged people on work placements as grocery attendants. Gillies said Co-op recently offered to make signing bonuses retroactive, but he said that's not enough to break the deadlock over the tiered wage offer. New hires at most locations would make $1.67/hour less than new staff at the Circle Park Co-op, a former Safeway location which continues to be represented by the Retail, Wholesale and Department Store Union. Gillies said shoppers will vote with their wallets. "I was on the line on the weekend and I was blown away by the community support and how people are choosing to shop elsewhere during job action," said Gillies​.